Sch. nr. 34 a. Woll nr. 40. 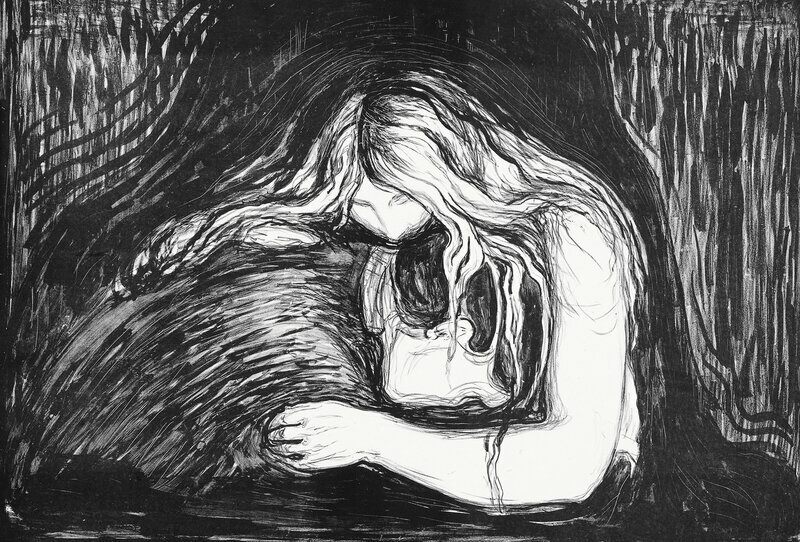 2 stempler fra Munch-museet på baksiden av arket, med påtegnelser med blyant og penn: "66a; 195-24; Bo nr. 195-41 (overstrøket); Sch. nr. 567-50", som viser at det var med på Det store Munch-lotteriet i 1983. Stamped with 2 stamps on the verso from the Munch-museet indicating that the sheet was part of the testamentary gift from Edvard Munch to the City of Oslo and that it was lotted in the big Munch-Lottery 1983. Annotated by the museum with numbers on the verso: 66a; 195-24; Bo (Lot) no 195-41 (erased); Sch. No 567-50. Sch. no. 34 a. Woll no. 40.